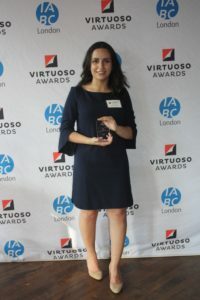 Jenna Fayad, recipient of the 2018 IABC London Award, was presented with her award at IABC London’s Virtuoso Awards Celebration in May 2018. Established in 1988 as the John Burke-Gaffney Award for Organizational Communications, this $500 award was renamed in 2007 and recognizes a Western University student who demonstrates aptitude and interest in corporate communications and public relations. Presented annually, it is open to Western students registered in the public relations diploma program offered through Continuing Studies or communications-related courses in faculties of Arts and Humanities, Information & Media Studies or Social Science; Continuing Studies; or the Ivey Business School – in the 2018/2019 academic year. Minimum 80% average for the program or past year of study. The number of communications-related courses will be taken into consideration. Overall interest in the field of business and creative communications. Career plan as a practitioner in the communications and public relations industry. Please note that the call for applications for the 2019 IABC London Award is now closed. The 2019 award recipient will be notified in May and the award will be presented on June 6 at IABC London’s Ruby Jubilee – an evening of laughter, networking and celebrating excellence to mark our chapter’s 40th anniversary. 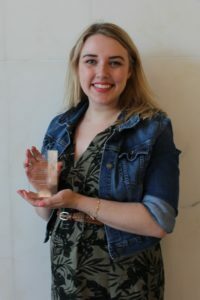 Caitlin Austin, recipient of the 2018 London Life Student Award of Excellence, was presented with her award at IABC London’s Virtuoso Awards Celebration in May, 2018. This annual award is given to the highest achieving student in the Corporate Communication and Public Relations Ontario Graduate Certificate Program at Fanshawe College. The recipient will receive a $500 award. The College selects the student based on the highest grades attained during the intensive eight-month program. 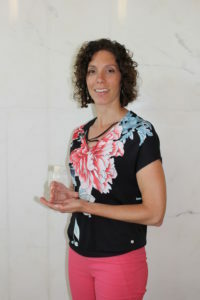 Lindsay Maraccio, recipient of the 2018 London Life Leadership Award, was presented with her award at IABC London’s Virtuoso Awards Celebration in May, 2018. The recipient is a student who has strong leadership skills, is a team player, and demonstrates competency in all aspects of communication. The recipient is awarded a $500 award. The student’s peers in the Corporate Communication and Public Relations Ontario Graduate Certificate Program nominated the recipient and a committee reviewed and selected the award winner. 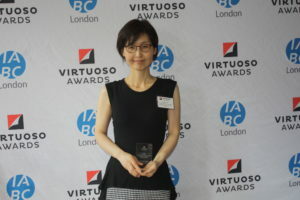 Sookeun (Lucy) Jo was presented with her award at IABC London’s Virtuoso Awards Celebration in May, 2o18. Recognizing outstanding achievement by a third year student, this $500 award is presented to the individual who has demonstrated the highest overall academic performance in graphic design, selected by faculty administrators at Fanshawe College.